At Austbrokers International, we pride ourselves on personalised service. To help you get to know your brokers, we’ve asked them a few questions about their career, their insurance specialisation, and what they love to do when they’re not in the office. Today, we sat down with Emily-Rose Clark, one of our Canberra-based brokers. She joined Austbrokers International in 2017, strengthening our team by bringing her a deep understanding of Workers Compensation insurance. 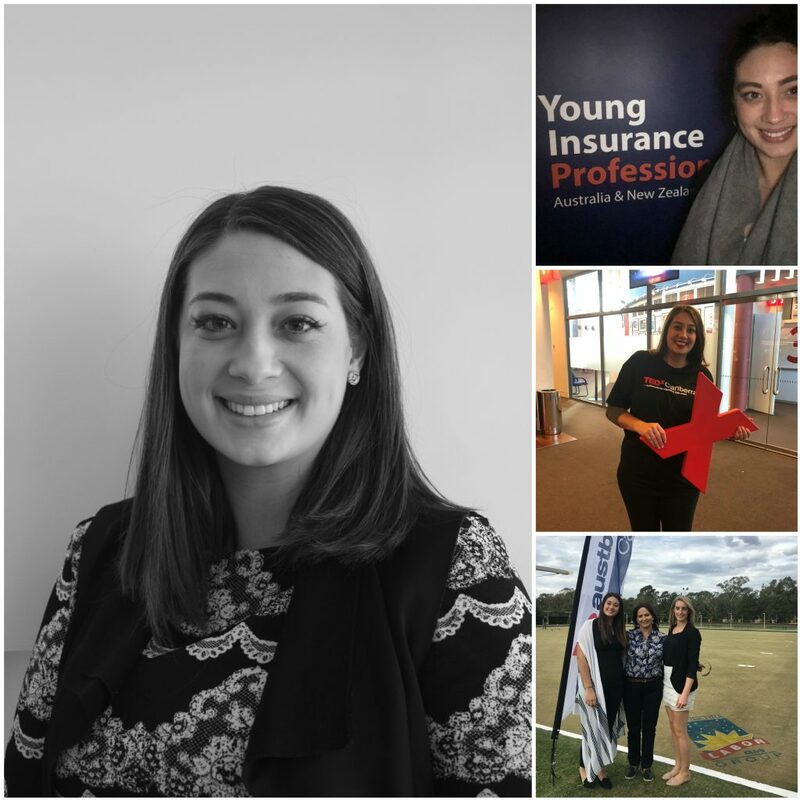 When she’s not in the office, you’ll find her volunteering at TEDxCanberra, and Young Insurance Professionals – ACT, or bouncing around the fun-centres of Canberra with her favourite nieces and nephews. How would you describe your area of specialisation? My eleven year career in the insurance industry has included working for two global insurers, specifically in their Workers Compensation division. With the help of my assistant, Liam, I am able to manage my client’s entire business insurance requirements including Public Liability, Professional Indemnity, Construction Insurance, Motor Fleet and more. With my background, naturally I can offer a bespoke service for my clients Workers’ Compensation concerns and needs, including liaising directly with insurer’s underwriting and claims handling staff, ensuring the best possible results are secured for my clients and their employees. What are the key Worker’s Compensation concerns clients have? Understanding and awareness of the ACT Workers Compensation Act. What are the most common Worker’s Compensation claims? This is a very broad question because they truly vary based on the client’s industry. If they are in the administration or hospitality industry then there are common slips/trips, lacerations and sprains and strains. In construction, the risks and exposures are much higher and attract more severe claims; the common injuries include lacerations, crush injuries and fractures. How do you stay on top of changes in legislation or insurance requirements? Being out and about, talking to as many people in the industry as possible including Insurers, Solicitors and Rehabilitation Providers. Loads of reading to gain insights to any trends that are occurring and most importantly, keeping an eye on what cases are going through the courts that may set a new precedence. What is the one thing you’d love every client to ask you about Worker’s Compensation? Workers Compensation’ can be measured by a risk profile which is made up of a series of factors but predominately your industry and the quality of risk management measures in place. Similar to Property Insurance, when we ask about fire protection and security measures that can mitigate theft or damage. There are three views to a client’s risk profile in the Insurance industry; the owner of the business’ view, the broker’s view, and the insurer. It’s my job to be the intermediary between the two to ensure pricing and coverage is adequate. It is important when clients are aware how the insurer view their business, how risk profiles are analysed to then empower Employer’s to improve their rating that leads to a better outcome for all involved. Where do companies/businesses leave themselves the most exposed when it comes to Worker’s Compensation? Work, Health & Safety Management and not providing a safe environment for all workers. What began your interest in this area? Personal injury claims are more emotional than any other insurance class. When a roof leaks or a car is damaged, it is assessed, repaired and settled. When you’re dealing with people’s livelihood that has been put in jeopardy by an injury sustained at work, it is very personal. I think it’s important that all stakeholders involved during a claim are not only aware of their obligations under the Workers Compensation Act 1951 (ACT), but also aware of the impacts that both the sustained injury and claim process can have on an injured worker’s life, and the potential gap to business operations. My interest in this area stems from my beliefs of achieving a purposeful life with quality, and not just standard of living, so I really enjoy being able to take the stresses away from my clients, so they can focus on doing what they do best. Having a diversified Insurance career across, which included roles in sales, claims, underwriting and account management, I appreciate the importance of narrowing your customer down, however I truly can’t choose a certain industry or size of client that I currently assist. My current client base spans from the satisfied traditionalists to the start-up techies, also the analysing sceptics and sophisticated opportunists across construction, hospitality, communication, manufacturing and retail industries. This approach allows me to service a broad client base which tests my abilities to relate and communicate pertinent information to different demographics and industries and gain the right experience to offer better service in the future. This style allows me to relate and engage with small, family-run businesses, medium sized enterprises, large local companies, and international organisations alike, which allows me to adapt my servicing offering to the needs and wishes of the client, and not use a “one-size-fits-all” approach that dominates the current insurance industry landscape. When you’re not helping businesses to better protect themselves, where will we find you? Hanging with my niece and nephews at Flip-Out, Inflatable World and competing with them at iPlay. You will also find me on the Volleyball or Netball court playing for my local club but my favourite pastime over the past two years has been volunteering for TEDxCanberra which is an independently organised TED Talk event! I also volunteer for the Young Insurance Professionals and promoting our industry as a chosen career for many young professionals.